I have one condition when it comes to diet changes. I won't change in a way I can't imagine keeping up the rest of my life. I guess my mom's horror stories of weight-gaining diet aftermaths were duly noted. "Ruined my metabolism," she'd say and I'd listen because at five foot two, she'd peaked somewhere close to two hundred pounds. She's gorgeous and thin now, but I hope to bypass the detour. So I've never been on a diet in my life. For a year and a half, I've strength trained with a personal trainer once a week and done cardio (on my own) three times a week. I now limit myself to one dessert a day and eat a smaller portion of pasta and larger portions of veggies. This is key when you're a vegetarian who grew up with real Italian cooking! When I began watching what I ate, I just tried to do better than I used to. If I'd normally have four Keebler cookies, I'd have two and figured with increased activity and fewer calories, I'd see some change. I did EVENTUALLY. My friends started saying they could tell and now I'm the size I set as my goal, but I'm not quite pleased. I mean, I AM pleased! That I stuck with it, that I even got this far, all of that, but I'm not completely satisfied. The goal size was based on what I knew to be possible post-kids. 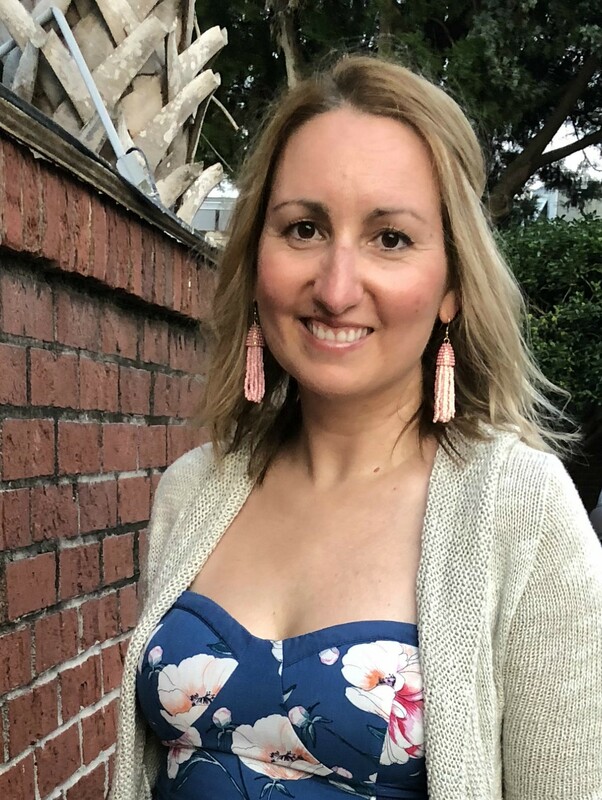 I'd lost enough weight in the first three years after carrying the twins, that I felt skinny. It was an inactive skinny, but after waiting three years, I was glad skinny came to call at all. I bought a pair of jeans that I dearly loved and enjoyed until we started renovating. We took a lovely house, born in the 1920s and made it our forever home in four months. Someday, I may tell you about it, but for now, lets just say, I ate bad stuff. A friend brought over a loaf of chocolate, chocolate chip, zucchini bread and I ate the whole thing in two days because all I had to do was slice it and I was so exhausted. I grew out of my favorite jeans and thought, "I'll lose it after the project." That was my pre-baby, twenty-something brain talking. Lesson learned: come hell or high water, you may let anything go, ANYTHING, but you will eat right. I held onto the jeans and believed, even when they wouldn't come up past my thighs. The jeans have fit for some time now and thanks to the muscle I gained, I weigh six pounds more than last time I wore them. From this vantage point, I'm wondering about a new goal. I've been this weight for a WHILE, plateauing thanks to my stubbornness about dieting, but here's my thought: If the eating I'm doing now is maintaining a weight, I can probably eat like this when I'm happy with my weight (and by that I mean size, shape, texture). However, in order to lose a bit more, I could be extra good for a while and then after I lose, return to the eating habits that I can live with forever. By George! I realize this isn't rocket science, but it shows how dense we are when we hold too tightly to a stance we've taken. I have no idea how helpful these things will be, but they seem doable and measurable. The nice part of a diet that's intended to be temporary is I may discover it's not so bad, or I feel so much better, I want to keep it up the rest of my life. *If you hate salad without dressing as much as I do, try this. Drizzle your empty bowl with olive oil and sprinkle with McCormick's Garlic and Herb Salt-free seasoning. If you're really feelin' it, you can rub the bowl with a clove of garlic cut in half. 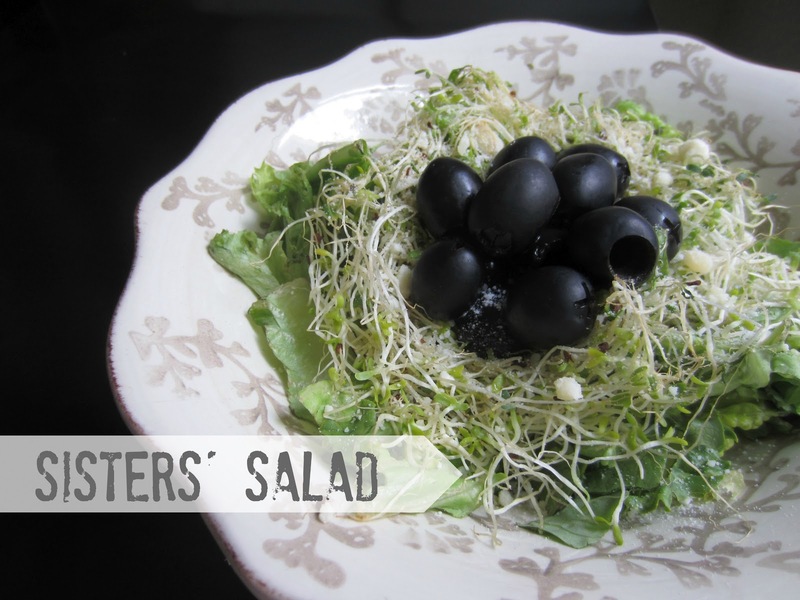 Add green lettuce, alfalfa sprouts and black olives. Sprinkle with Parmesan cheese. Actually, Chia seeds are awesome because they don't have a lot of weird flavor. Also, I have lost almost thirty pounds by doing dessert only a few times a week either in the morning or lunch. Breakfast is great because I feel like I use the energy right away and I love looking forward to dessert. I also started making healthy desserts and using things like Stevia and/or Agave to sweeten things. Also, if you like smoothies, you can make all kinds that sometimes sound bizarre but are really good. Forks over Knives or the Engine 2 diet websites have a lot of really good family friendly recipes too. Good point about the sacrificing now so that you can eat more normally later. I am going to have to keep that in mind on the days I want to cheat.